Maintaining proper health can sometimes seem like a full-time job. There are so many things being heralded as the “easiest way to beat” this disease or that ailment, but what about taking small actionable steps to ensure one disease doesn’t have to be in your future? For example, we can prevent the development of several awful diseases later in life by limiting the amount of asbestos we’re exposed to today. April 1-7 is Global Asbestos Awareness Week, and it’s important to understand where the mineral might be hiding in our homes and how to best handle those situations. Asbestos is a naturally occurring and microscopic fibrous mineral that has been used in both industrial and commercial settings. It was thought to be a miracle substance due to its ability to resist fire, electricity, and most chemical reactions, and was used in many building materials. Asbestos can be found in products like wallpaper, piping, cement, insulation, floor/ceiling tiles, and heating ducts. Many homes built in the United States between 1930 and 1980 have some kind of asbestos-containing materials in them. Exposure to asbestos can lead to illnesses such as asbestosis, and both lung and mesothelioma cancers. Historically, those impacted were laborers and blue collar workers mining the mineral, but more recently there have been instances of asbestos exposure through DIY remodeling projects that disturb asbestos-containing materials in homes. There are some 15,000 asbestos-related deaths in the United States each year, and mesothelioma cancer fatalities account for 2,500 of those. The rare and aggressive cancer develops following inhalation of airborne asbestos fibers. Between 1999 and 2010, more than 31,000 people in the U.S. died from mesothelioma. The cancer can develop in the lining of the heart, lungs or abdomen. Pleural mesothelioma, the most common form of the disease, occurs in the lungs and is often fatal within two years of diagnosis. Asbestos exposure is the only known cause of mesothelioma and there is currently no cure and very few treatment options. The limited number of viable treatments available are rarely utilized, as the disease is typically not accurately diagnosed until it has progressed into the third or fourth stages. In these later stages, the cancer has often metastasized into other areas of the body. Late stage diagnosis is also common due to the latency of symptoms. Mesothelioma symptoms may take decades to present themselves, typically manifesting 20 to 50 years after asbestos exposure; once symptomatic an accurate diagnosis can still take months. Symptoms vary for each form of the cancer and there are few physicians who are familiar with the disease and can properly treat those suffering. Because the cancer is so rare, it’s imperative for those who believe they may have been exposed to asbestos to provide their doctor with a detailed medical and occupational history to enable proper diagnosis. Asbestos exposure can also lead to asbestosis. A patient with asbestosis has inhaled the toxic fibers and now has scar tissue inside their lungs. Asbestosis is not fatal but can negatively impact day-to-day life, and those who have the disease are at an increased risk of also developing lung cancer. A physical exam from a mesothelioma specialist using diagnostic tests like x-rays and breathing tests are required to accurately diagnose the disease. If your home, office, or school was constructed between 1930 and 1980 do not be shy about asking if asbestos is potentially in the structure. Asking some rudimentary questions now can stave off a difficult diagnosis later in life. 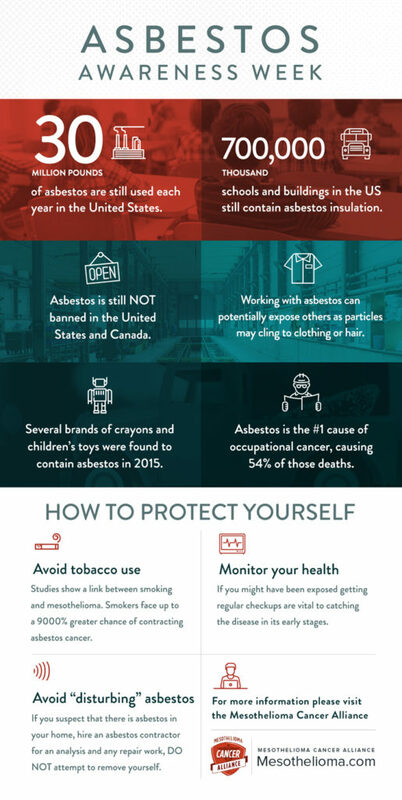 In honor of Global Asbestos Awareness Week, empower yourself and your family with the facts.